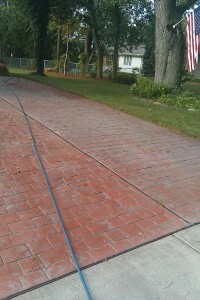 Cleaning and sealing colored and stamped concrete should be done on a regular basis just like any other home maintenance. The frequency will depend on how high a traffic area to cars, foot traffic, water, and any chemicals the concrete is exposed to. Experts recommend resealing every 2 or 3 years. If you wait longer, you may notice the color fade. 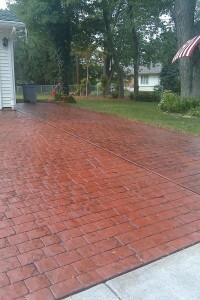 But just like waxing a car, reseal your concrete and the color will be as vibrant as the day it was installed. Will My Stamped Concrete Need Repair? Stamped concrete is one of the most durable and long lasting paving materials available, and is highly resistant to cracking when installed correctly. There are some basic steps you can take to minimize cracking and ensure good performance. Properly maintaining your concrete investment is one of the most important steps if you want it to last as long as possible. 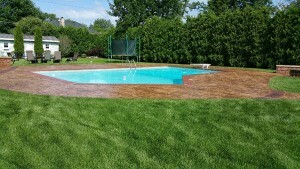 Adding to the value of decorative concrete is the material’s inherent strength and endurance. Like conventional concrete, stamped concrete will provide decades of service when properly installed and maintained, even when exposed to harsh winter weather conditions. Applying a sealer to your decorative concrete is a smart and affordable preventative measure that can be taken to preserve its beauty and extend its service life. Contact Bravo! Buffalo today for your free estimate!